Many Eastern and Western philosophies teach the universe is made up of elements that need to be harmoniously balanced in order to support proper flow of spiritual and life force energy. 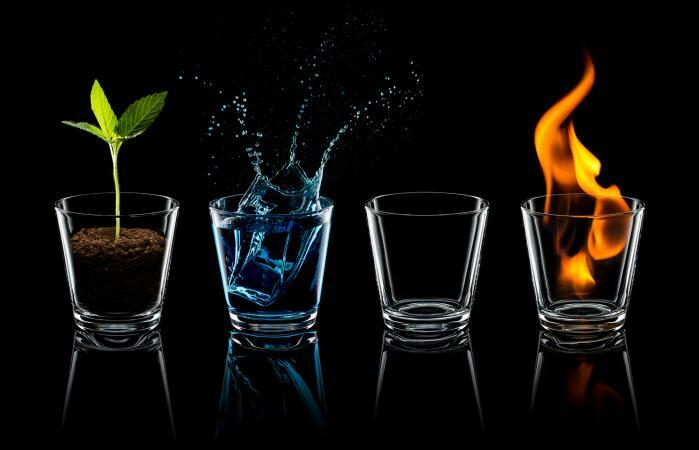 The elements of earth, wind, fire, and water are a variation of the four classical elements of nature, while the elements of water, fire, wood, metal, and earth are the five feng shui elements. The earth element is found in both classical and eastern philosophy. In both traditions, the properties and representations of this element are similar. The fire element is also recognized in both Eastern and Western philosophy, and it is the most powerful and active of all the feng shui elements. To incorporate those shapes or the color red in your home, think pieces of art or figurines. The water element is the third element of three elements that appears in both classical and feng shui philosophy. While there isn't a set of elements in eastern or western philosophy that contain earth, wind, water, and fire, this grouping most closely corresponds to the classical elements. However, although wind is not a specific element in feng shui, it does play an important role in the practice of this form of energy work.